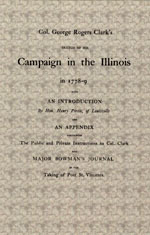 Softbound, 128 pages, 5-1/2" x 8-1/2" The journal of Col. Clark's campaign into Illinois, containing both the public and private instructions to Col. Clark by Patrick Henry, then Governor of Virginia. Also includes portions of Maj. Bowman's journal on the taking of Post St. Vincents.